Honeywell has committed significant resources to cleanups of chromium residue in Hudson County, working closely with regulators, professional environmental and engineering organizations and, most importantly, local communities. Government standards, including those for air quality, were met at all times. State regulators and / or the federal court supervised the work. Significant areas have now been cleaned up and are posed for redevelopment. A major cleanup along Route 440, a site currently occupied by Jersey City public entities, as well as property along Kellogg Street, was completed in December 2016. The residue, which came from the production of chromium, was used as fill in Jersey City and Bayonne from the 1900s until the 1970s. The cleanups address hexavalent chromium above state standards. In 2009, Honeywell completed the cleanup of the former Roosevelt Drive-In site under the supervision of the federal court. About 1.3 million tons of chrome ore processing residue (COPR) were removed from the site and replaced with clean fill. An underground barrier wall and pumping system controls groundwater. All air sampling results were significantly below the hexavalent chromium concentration level approved by the court for this project. Today the site is clean and ready for development. Security is maintained at the Security Station located at 80 Kellogg Street. 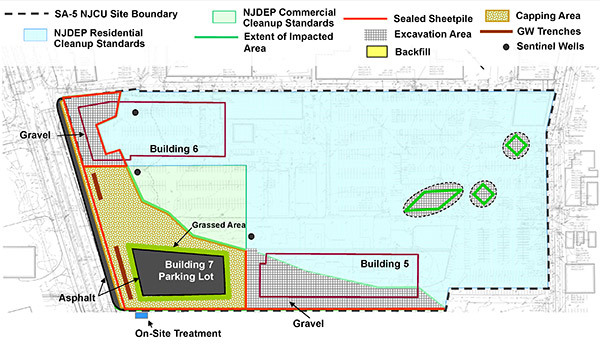 Working in coordination with NJCU, Honeywell, in February 2012, completed its remediation of two former manufacturing sites located along Carbon Place between Route 440 and West Side Avenue. The combined site is being redeveloped by NJCU for the new West Side Campus. The cleanup included the removal of 40,000 cubic yards of contaminated soil, construction of an underground barrier wall and pumping system to control groundwater, installation of a multi-layer capping system, importing 40,000 cubic yards of clean soil, and continued monitoring of soil and groundwater. A new dorm for NJCU students opened in the fall of 2016, market-rate residential properties are currently being built, and athletic facilities are slated to be developed on the site. Removing COPR from a site at the corner of Ocean and Cator Avenues in Jersey City was a successful Honeywell project that allowed the property to be reused for the construction of a new public school, which opened in the fall of 2016. The remediation involved excavating roughly 8,500 cubic yards of contaminated soils, replacing with clean soil, monitoring air and groundwater, and controlling dust levels. Honeywell conducted a remediation at College Towers in 2002. Under the supervision of the New Jersey Department of Environmental Protection (DEP), soil that contained chromium residue was removed. Clean fill was brought in to replace the contaminated soil. Improvements in the parking lot area were completed in December 2010. Honeywell also has been monitoring groundwater at College Towers on a quarterly basis since 2002. Honeywell has taken significant steps to investigate and remediate chromium residue used as fill in the construction of the Bayonne Sewer pipeline. Areas containing hexavalent chrome above state standards have typically been found within a narrow width on either side of the pipeline. Honeywell has completed a large portion of the investigation, capped two portions of the pipeline, installed fencing to restrict unauthorized access, and removed some soil near the former Hi Hat property. The final phase of the investigation work has been implemented. Honeywell, along with two other companies, reached a settlement with DEP in June 2011 to allocate responsibility for the remediation of all remaining orphan chromium sites in Northern New Jersey. Orphan chromium sites are those where there is no evidence of a company's connection to a particular site. Investigation and remediation work is ongoing at these sites. Investigations have been completed. Remediation will be done in conjunction with surrounding orphan sites.